New Moon in Pisces was a Total Solar Eclipse, one of the highlights of the year. Pisces is the last sign of the zodiac, and the Sun was eclipsed by the Moon in the last degree of Pisces. Only about thirteen hours later, the Sun ingressed Aries and entered a new phase on its cyclical journey around the zodiac. The Sun’s ingress into Aries marks the spring equinox, when the length of night and day is equal everywhere on Earth. 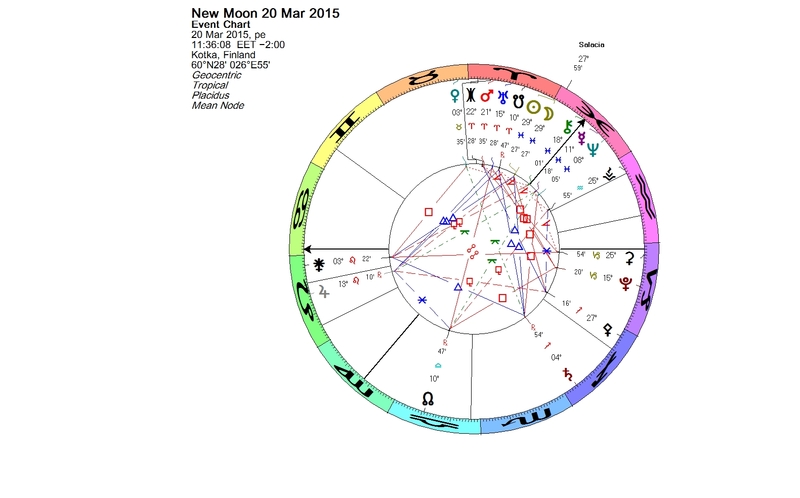 It is also the beginning of a new astrological year. The eclipse occurred near another notable event, namely the last of the seven Uranus-Pluto squares, which have taken place between 2012 and 2015. The last square happened on March 17, 2015. Uranus-Pluto square is the long term aspect defining our era. At the time of the Solar Eclipse, the luminaries were in conjunction with 120347 Salacia. Salacia is a binary Kuiper belt object, named after the goddess of salt water, the wife of Neptune. Salacia is orbiting the Sun at an average distance slightly greater than that of Pluto. The primary body was discovered in 2004 and assigned a name in 2011. The companion was named Actaea. Both bodies in this binary system are named after sea nymphs, nereids, which are said to be sailors’ friends. 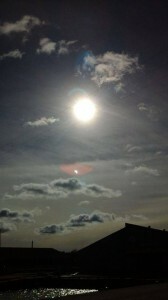 I was witnessing the eclipse in the City Port of Kotka, where about 82% of the Sun’s disc was obscured by the Moon. Thin clouds were moving across the sky, but they did not prevent seeing the phenomenon. At the peak moment the color of the light was extraordinary. The ocean plays a fundamental role in the world’s water supply, as do the major ice fields. The water cycle is powered from solar energy. 86% of the global evaporation occurs from the oceans. When water evaporates, it takes up energy from its surroundings and cools the environment. Today is the World Water Day. It is celebrated around the world every year on March 22. It’s a day to celebrate fresh water. 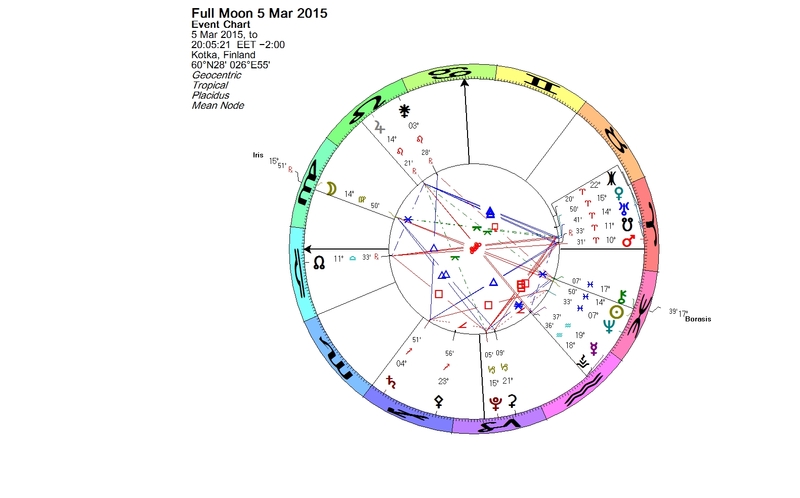 The Moon was full in Virgo on March 5, 2015. In the opposing sign Pisces, the Sun was in conjunction with two minor planets, Chiron and Borasisi. Chiron has been called the rainbow bridge. In conjunction with the Moon was asteroid Iris, named after the personification of the rainbow. 7 Iris was discovered in 1847. It is one of those early asteroids which were considered planets at the time of their discovery. The rapidly growing number of bodies between Mars and Jupiter led to their reclassification as asteroids by 1854. Iris is bright and quite large. It is the fourth brightest object in the asteroid belt, and with about 200 km wide diameter, almost as big as Chiron. In mythology Iris is the personification of the rainbow and messenger of the gods, particularly Hera. She is a female equivalent to Hermes and Mercury. Iris is often represented as a young maiden with golden wings on her shoulders and a caduceus in her hands. She travels with the speed of the wind, connecting gods and mortals. She is a guide and adviser, and her presence can be seen as a sign of hope. Chiron was the first centaur planet discovered (in 1977). Astrologically Chiron is a symbol of healing and transformation. The healing is usually achieved through some amount of pain. Chiron raises awareness, whereas Borasisi tends to blur it. 66652 Borasisi is a binary Kuiper belt object discovered in 1999. The companion is named Pabu. The names come from a fictional creation myth told by Kurt Vonnegut in his novel Cat’s Cradle. In the novel, the fictional religion of Bokononism is based on lies. One who believes harmless untruths will have peace of mind and a happy life. The sign Virgo is associated with tendency to discriminate and prioritize. Be careful what you throw away from your life just now. Take notice of Iris’s subtle advice. You are currently browsing the Lunations by Kirsti Melto weblog archives for March, 2015.